scheduled for Wednesday, when West will announce his findings. In the UK, where an investigation into the death of 10 British nationals, is being supervised by Leicestershire coroner, Catherine Mason, all court proceedings have been suspended without a date being set for inquest. It was reported in the Melbourne court that British post-mortem experts participated in the Dutch investigations, alongside Australian, Dutch, and German teams, plus a joint Indonesian-Malaysian group. In court, in addition to members of the Coroner’s staff, there was one government intelligence agent who kept his official identification tag inside his coat, and refused to say whether he was an Australian or American national. 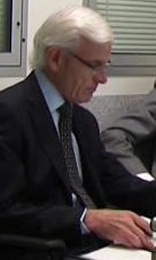 Donoghoe (below, left) was the lead witness. He continues to direct a team of 22 Australian police, forensic specialists and intelligent agents stationed in The Netherlands and Ukraine. He was followed by Dr David Ranson (right), a Victorian pathologist who led a team of 4; they worked at the Dutch military base at Hilversum in July and August of 2014, after the bodies of the MH17 victims were taken there for identification and forensic analysis. Donoghoe said a full report by the AFP had been included in the coroner’s evidence. Ranson has filed two reports with the coroner – one of August 25, 2014, and one on December 16, 2014. So far the Coroner has classified these documents as secret. For details, read this. Testifying on oath, Donoghoe revealed for the first time that the Australian government had quietly negotiated two agreements to investigate the crash site in eastern Ukraine. The first, he said, was with the Ukrainian government in Kiev for security around the crash site. The second was with Novorussian leaders in order for the Australians to carry out their searches for victims’ bodies, personal property and other evidence, as well as to run a command post in Donetsk city. Political recognition by the Australians of the separatists has never been acknowledged before. Donoghoe refused to say who signed the agreement for the Novorussians. For the first time also, Donoghoe acknowledged publicly that the international investigators had had “no ability to collect aircraft parts or other debris”. It was not until May 2015, he added, that forensic examination of the aircraft began. 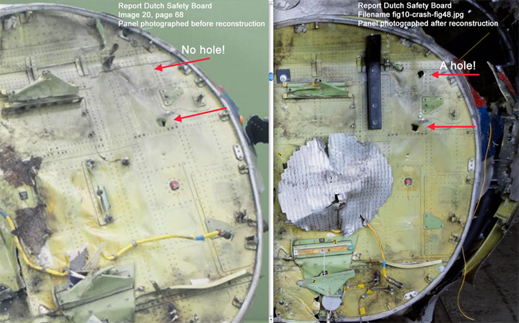 The recovered aircraft wreckage was first photographed and registered in The Netherlands by the DSB. Image-1 shows the first DSB photograph, with a single hole visible. Image-2 shows that a new photograph published by DSB reveals a second hole. See here. In his testimony Donoghoe said that ten months after the crash, and after Kiev officials had handed over less than half the fuselage fragments to the Dutch, the discovery was made of “some fragments not consistent with debris of the aircraft”. Had he found shrapnel from an explosive device, missile or cannon? Donoghoe refused to answer. The deaths of the passengers, he testified, had been caused by “inflight breakup [of the aircraft] and immediate decompression”, not by munitions. The lack of shrapnel as evidence of cause of death is analysed here. Australian police calls for Ukrainian witnesses on the ground, who may have seen or heard what happened on the fateful day, were issued in March 2015, and then again in June. Some of those who came forward to testify refused to do so, Donoghoe said Tuesday, unless the Australian and Dutch police protected them in “a safe location”; excluded Ukrainian government officials; and kept the identities of the witnesses secret. Ranson, who is an associate professor of forensic pathology and deputy director of the Victorian Institute of Forensic Medicine, told the court he and his team had spent two and half weeks studying the victims’ bodies at Hilversum. There, he confirmed, X-rays and CT scans were carried out and more than 700 autopsies. He testified that when the Australian victims’ bodies were repatriated to the morgue at the Coroners Court, another CT scan was taken of each body, and matched against the scan taken at Hilversum. Ranson’s reports ruling out the presence of shrapnel from a missile strike in any of the MH17 bodies have been kept secret to date. On oath, Ranson told Coroner West the deaths of the passengers had been caused by the aircraft breaking up. He dismissed the possibility that an oxygen mask found on a body on the ground had been worn by the victim. There was no DNA evidence to support that, and little likelihood, Ranson said, that the high-speed airflow through the aircraft at decompression would have left oxygen masks on the victims, if they had time to put them on. Death came too fast, Ranson believes.